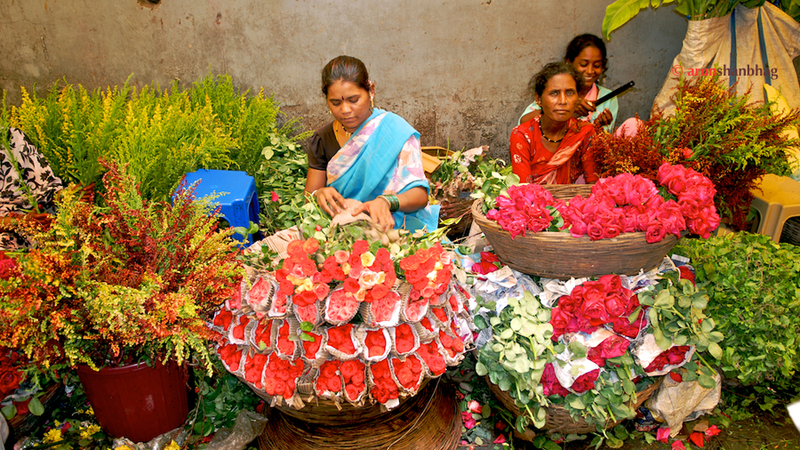 Few years ago I wrote about the Dadar Flower Market, in Mumbai. Tucked under the bridge next to the Dadar train Station, like alien slime it oozes into adjoining alleys and walkways, filling every doorway and cranny. So jam-packed, my cousin cautioned, “don’t even try to put your hand in your pocket, it will go in someone else’s.” Aaargh! Only in Mumbai. But it IS an experience. 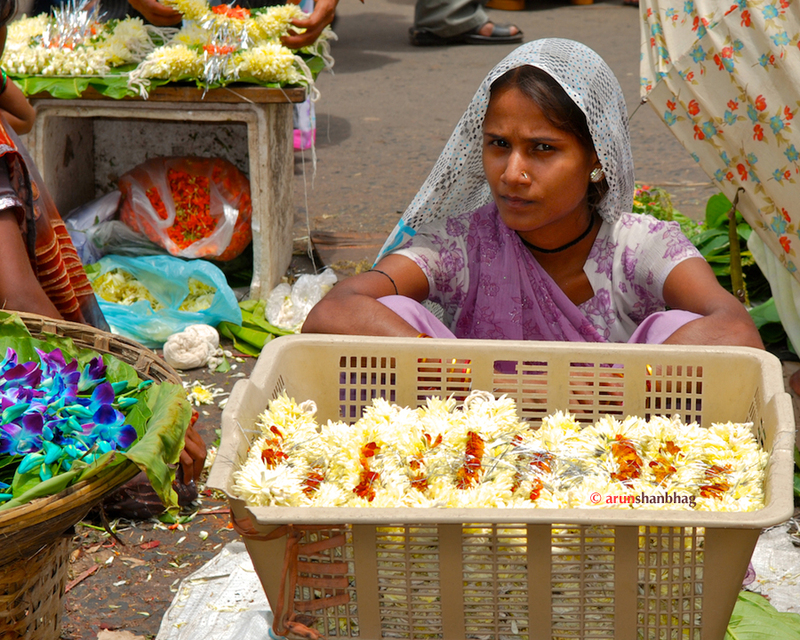 Not just for colorful flowers, but to see up close how the poor make a living. And be bothered by seeing young girls selling flowers for a living, when they should be in school. Politicians mouth big speeches about expensive projects to eradicate poverty. The money ends up in their Dubai bank accounts, while the poor fester near open sewers. I want to be bothered. It is far easier, NOT to go; NOT to see. Stay home, play with Meera, take a nap, go to a nice restaurant for frothy Kaapi. You and I, we need to be nudged from our comfort zones; we need to wade through muck and see how the poor work and live. We need to be offended; get mad at impotent politicians. As I edge my way through the crowds; my heart races and I’m in a zone. The din of the market is white noise, sharpening my thoughts and focus; I ignore the rotten ooze creeping in my sandals and in between my toes, impervious to odors of rot, the shoves and jostling. I don’t hear the screams and curses; I don’t feel the feet stepping on mine; of sweat soaked bodies pressed to mine, slithering ahead; a wet elbow crazes my cheek. I resist the temptation to wipe my face. I smile. I am mesmerized by the beauty here. 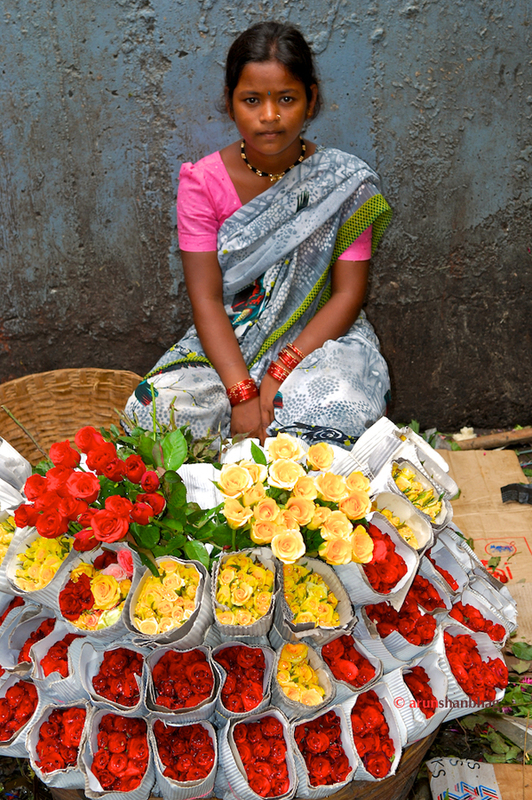 See this beautiful girl above selling roses. She’s not more than 12 years old, but dressed in a saree and tending this stall, while she should be sitting in a class room, in a clean dress, or playing with friends. She’ll never know that luxury. Trapped, waiting to bloom in your nice home. They are so used to this. THIS is their life. This family was all smiles. 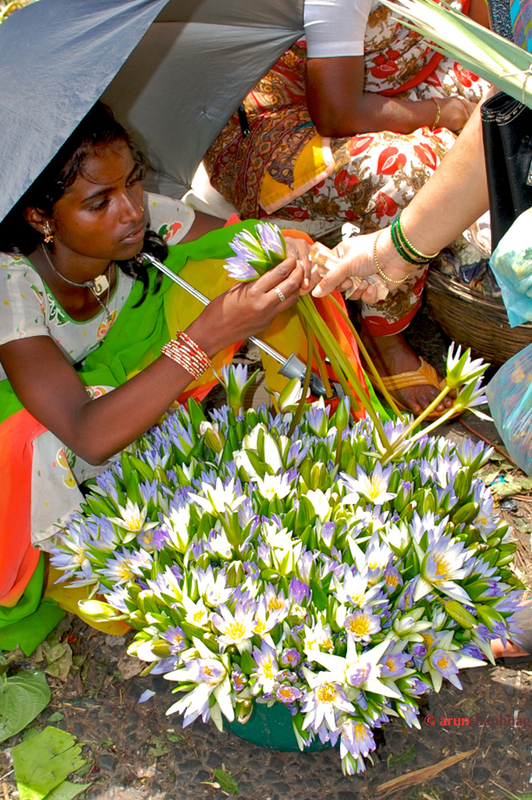 She had the only Neel kamal (blue lotus) in the market. In the blazing sun, she kept her cool under the umbrella, while patiently helping find the best. Rs 50 for a dozen. She observed my antics with a piercing gaze, but was too tired to smile. All giggles at being photographed. When you work and live on sidewalks, that is where you feed the baby. Mumbai Meri Jaan, anyone? But there is a God! 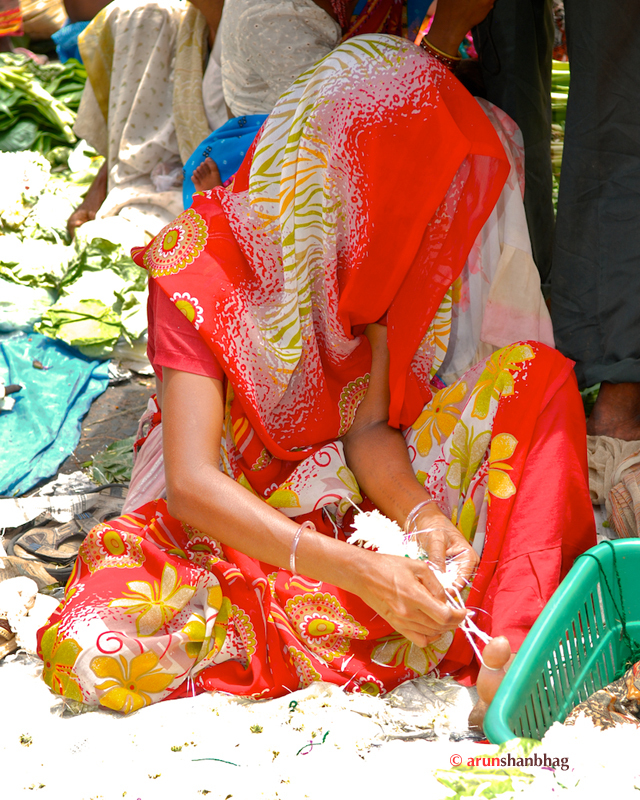 All flowers here are woven with the starting end looped around the big toe. 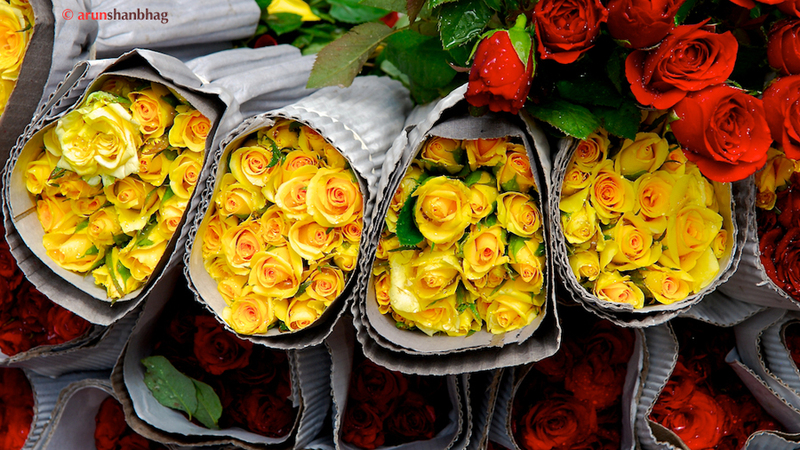 Yes, all flowers which end on the head of God, start the day at the dusty, tired feet of the working poor. 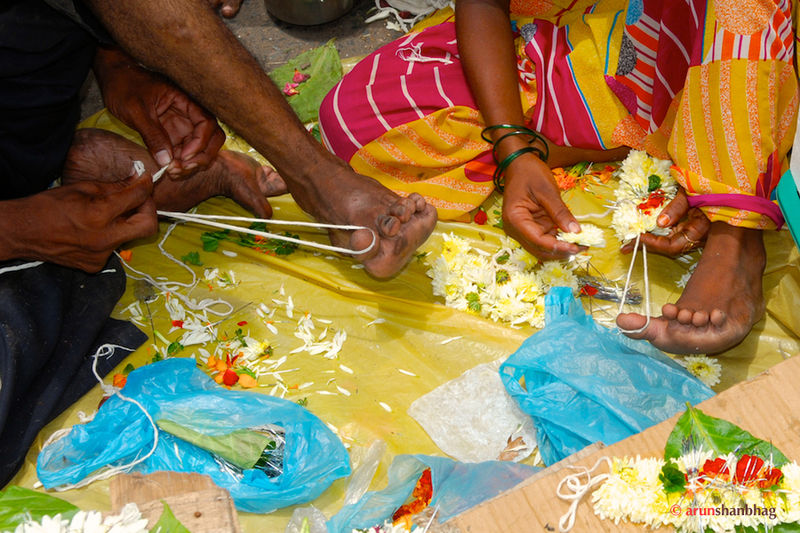 Each garland we brought was woven on the toes of these poor women. 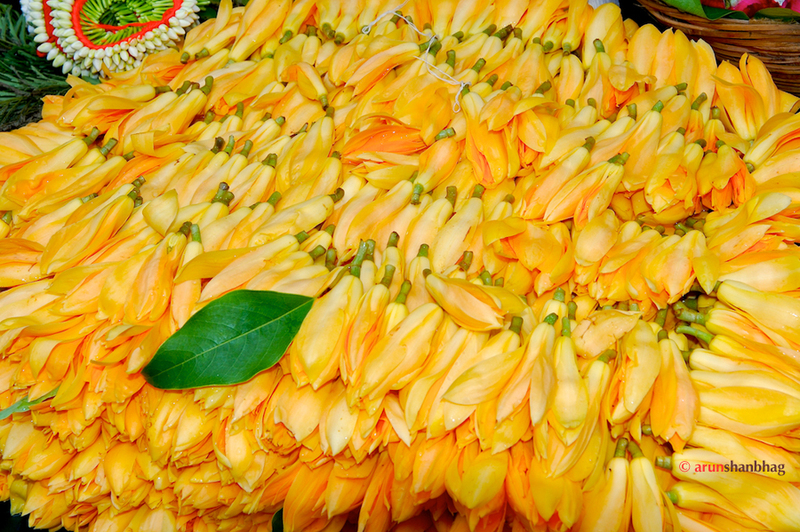 At home, we’ll sprinkle a few drops of water and then these flower decorate Ganapati during puja. 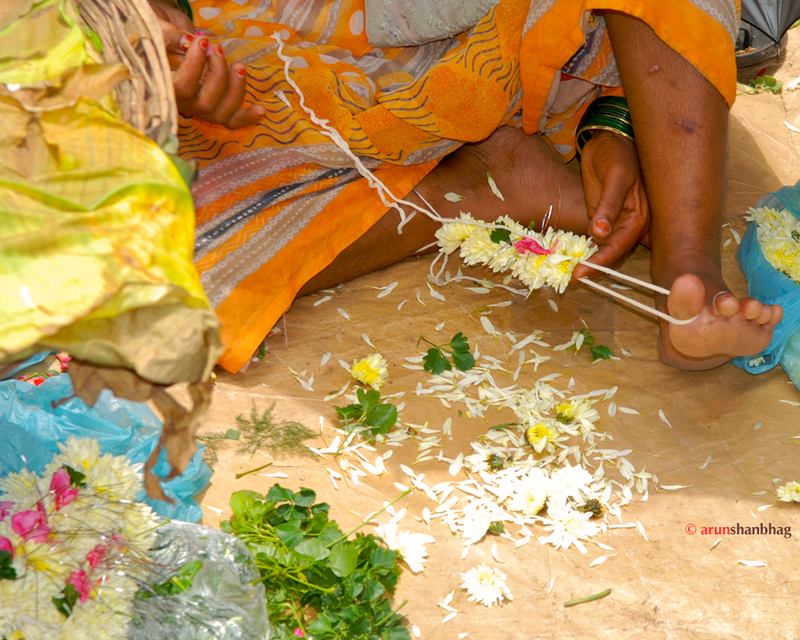 After puja, we receive a small portion of these garlands as prasad – a sacred gift from the Gods, which we will treasure. Fitting isn’t it? 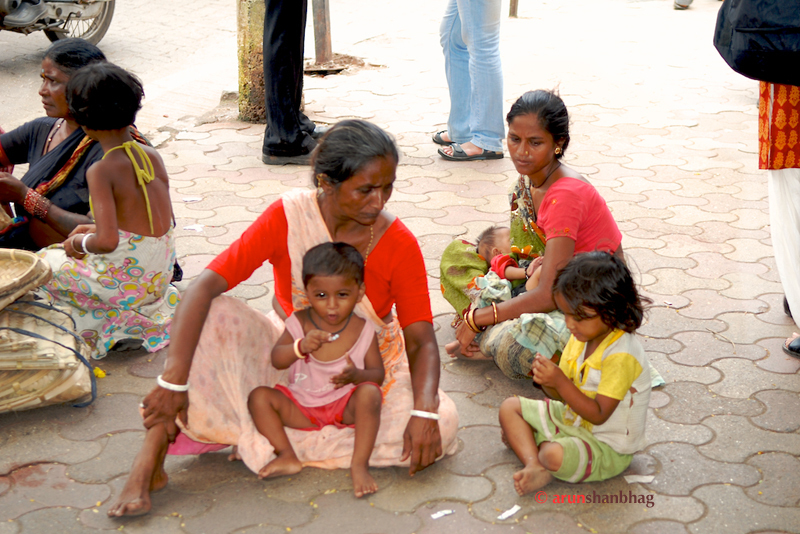 That which was woven on the feet of the poor, ends up on the most sacred of Gods. There is a God! And you know where to find her. The yellow tarp casts an eerie glow. I LOVE this blog post! The photos fuel my wanderlust. This is just beautiful! One day, I would love to visit Goa. On a trip to the temple last month, I was in a little canteen and one of the flower ladies came and sat next to me with her son. They were having a snack. I introduced myself and she was thrilled. Someone had told her about the pics on the web and she had seen them. Great joy. Had to share that. This is strange…I thought about you and your blog less than two days ago in the evening (Danish time) when I was following the attack on Boston on the Internet. Have not been to your blog for a long time and took the opportunity to do so now. A pretty little (big!) leurki, you’ve got! Thank you for sending positive thoughts to Boston! If you are talking about Meera, yes she is quite a handful, and has me completely wrapped around her little finger. Hope you are doing well in Copenhagen. Thanks to my smartphone I am able to answer this standing in our kitchen cooking Goa-inspired porc tenderloin in a curry with coco and steaming basmati rice at the same time. So as you can see, I’m doing fine here in Copenhagen! Nice! Now I am hungry (it lunch time here in Boston). Thanks; They are a beautiful people and have been walking around with them the last few days.